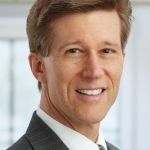 This article simulates the birthday-matching problem in SAS. 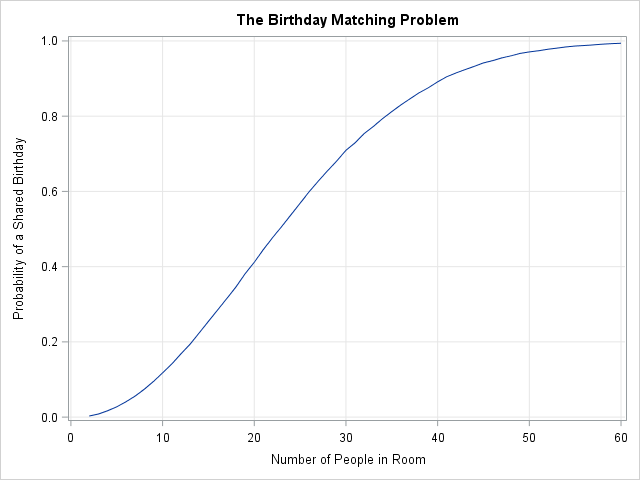 The birthday-matching problem (also called the birthday problem or birthday paradox) answers the following question: "if there are N people in a room, what is the probability that at least two people share a birthday?" The birthday problem is famous because the probability of duplicate birthdays is much higher than most people would guess: Among 23 people, the probability of a shared birthday is more than 50%. If you assume a uniform distribution of birthdays, the birthday-matching problem can be solved exactly. In reality birthdays are not uniformly distributed, but as I show in Statistical Programming with SAS/IML Software (Wicklin 2010), you can use a Monte Carlo simulation to estimate the probability of a matching birthday. This article uses ideas from Wicklin (2010) to simulate the birthday problem in the SAS/IML language. The simulation is simplest to understand if you assume uniformly distributed birthdays (p. 335–337), but it is only slightly harder to run a simulation that uses an empirical distribution of birthdays (p. 344–346). For both cases, the simulation requires only a few lines of code. Choose a random sample of size N (with replacement) from the set of birthdays. That sample represents a "room" of N people. Determine whether any of the birthdays in the room match. There are N(N-1)/2 pairs of birthdays to check. Repeat this process for thousands of rooms and compute the proportion of rooms that contain a match. This is a Monte Carlo estimate of the probability of a shared birthday. If desired, simulate rooms of various sizes, such as N=2, 3, 4,..., 60, and plot the results. Notice that the simulation requires only three SAS/IML vectorized statements. The SAMPLE function produces a matrix that has N rows. Each column of the matrix represents the birthdays of N people in a room. The COUNTUNIQUE function returns a row vector that contains the number of unique birthdays in each column. If you subtract that number from N, you obtain the number of shared birthdays. Finally, the estimate is obtained by computing the mean of an indicator variable. For convenience, the following SAS/IML statements define a function that simulates B rooms, each containing a random sample of N birthdays. The function returns a row vector of size B that contains the number of matching birthdays in each room. The program calls the function in a loop and graphs the results. The graph is shown at the top of this article. It shows the estimated probability of one or more matching birthdays in a room of size N for N=2, 3, ..., 60. The estimates are based on 10,000 Monte Carlo iterations. (Why did I use 10,000 rooms? See the Appendix.) As mentioned earlier, the probability exceeds 50% when a room contains 23 people. For 30 people, the probability of a match is 71%. If you put 50 people in a room, the chances that two people in the room share a birthday is about 97%. If you run the simulation, you will find that the estimated probability of sharing a birthday among N people does not change much if you include leap-day birthdays. The difference between the estimated probabilities is about 0.003 on average, which is much less than the standard error of the estimates. In practice, you can exclude February 29 without changing the conclusion that shared birthdays are expected to occur. In a similar way, you can set the probability vector to be the empirical distribution of birthdays in the population. Wicklin (2010, p. 346) reports that the simulation-based estimates are slightly higher than the exact results that you obtain from assuming a uniform distribution. This agrees with theory: A. G. Munford (TAS, 1977) showed that any nonuniform distribution increases the likelihood of a matching birthday. In other words, in the real world, the probability of a shared birthday is slightly higher than in the idealized mathematical world. Appendix: How many Monte Carlo simulations are necessary? Why did I use 10,000 Monte Carlo simulations? Notice that the Monte Carlo estimate in this problem is an estimate of a proportion of a binary variable, which means that you can estimate the standard error. If p̂ is the estimate, then a 95% confidence interval has radius 1.96 sqrt(p̂(1-p̂)/B), where B is the number of Monte Carlo simulations (that is, the number of "rooms"). This quantity is largest when p̂ = 1/2, so if you want, say, two digits of accuracy you can choose a value of B which is large enough so that 1.96 sqrt(0.5(1-0.5)/B) ≤ 0.01. Solving the equation for B give B ≥ 10000. If you choose that many Monte Carlo iterations, then the conservative 95% confidence interval has a half-width no greater than 0.01. This simple calculation shows that if you use B=10,000 for the number of simulated "room," you can expect the Monte Carlo estimates to be within 0.01 of the true probability 95% of the time. The standard error is largest where the curve is steepest (near N=23). You could add error bars to the graph, but the errors would be too small to see. Nice write up Rick. This was one of the statistics fun facts that I remember a statistic's professor in college used the first day of class to get students attention. There were about 30 students in class and sure enough two people had the same birthday.